The history of baseball is filled with grand tales. 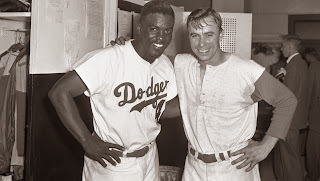 One of the grandest is the Jackie Robinson Pee Wee Reese embrace. In 42 that I wrote about yesterday the Jackie Robinson Pee Wee Reese moment is dramatized to great affect. For those unfamiliar with baseball lore, Robinson had encountered shocking abuse from racists. As baseball lore has it, Philadelphia and Cincinnati were particularly racist cities. Robinson was subjected to particularly intense racist hatred. Robinson was supposedly at a low point. Pee Wee Reese was from nearby Kentucky and a southern white man. Many of his friends and even family members were angry he would play on the same team as a black man. Hard to imagine today, but the divide between the two men at the time was perceived to be great--think Grand Canyon. The two men were not close friends but respected each other. In 2013 there is nothing unusual about this photograph of two ball players. When Jackie Robinson broke into baseball this image was shocking. In the film 42 the build up to the so called Jackie Robinson Pee Wee Reese embrace was long, dramatic, and accompanied by soaring melodramatic music. In the film Pee Wee Reese walks from short stop and across the infield to Jackie Robinson at first base. He puts his arm on Robinson's shoulder and the two men have a short chat. This changed baseball history and the way race was perceived in the United States. The cultural logic was simple: baseball is America. If baseball can be integrated all of America can and should be integrated. Pee Wee kind of sensed the sort of helpless, dead feeling in me and came over and stood beside me for a while. He didn't say a word, but he looked over at the chaps who were yelling at me and just stared. He was standing by me, I could tell you that. When I saw 42 I was deeply touched by this moment. And this is the power of folklore and film making. Mix a real life event, an ordinary event even, with great ideas and in this case the civil rights of all black people and you create history. Based on my knowledge of baseball history, average at best, the people involved are not as important as the story that is repeatedly told. Ask any American child about Jackie Robinson and they can retell this story. At the end of his life Reese did not like the fact he had been made out to be a hero. I cannot blame him. If there was a hero involved it was Robinson. I shudder to think of the racist abuse he endured. But like Reese, Robinson was not a myth but a real life human being. Robinson's widow Rachel recalled her husband mentioned Pee Wee Reese's gesture that day and recalled "It came as such a relief to him, that a teammate and the captain of the team would go ut of his way in such a public fashion to express his friendship." As I lay in bed this morning waiting for the sun to rise I realized why this event has been stuck in my mind. I have never had people publicly support me or my civil rights. Of course individuals have shown me great support. As I thought about that scene in the 42 I realized I was experiencing multiple primal feelings. I was deeply jealous. Like Robinson, for a while I have felt "dead inside". An overwhelming sense of helplessness has over come me in recent weeks. I have come to the conclusion I as crippled man will never have a Jackie Robinson Pee Wee Reese moment. I will never be equal. I will forever have to defend my civil rights and demonstrate my life is worth living. Worse, this life long battle will be mine and mine alone. The ADA is simply not widely understood to be civil rights legislation. Until this changes real equality will remain illusive. No wonder as the holidays approach my mood is grim.